Microneedling should be a part of everyone’s skincare regimen. Collagen. It’s what makes us look younger. Adequate collagen makes our pores less noticeable, wrinkles and lines less deep, and our skin tighter and texture smoother. The body’s collagen production starts decreasing in our early to mid 20’s. Taking an oral supplement really won’t provide much benefit. Microneedling, however, triggers a wound healing cascade of events, with the end product being — you guessed it — more collagen! Add PRP to the mix take your results to the next level, and it’s natural! Platelet rich plasma (PRP) is obtained from your blood. It is full of growth factors which will stimulate even more collagen production. This procedure has earned the nickname “Vampire Facial” primarily because we are using your own blood. This is a great way to rejuvenate your skin using only products from your body. Acne scarring, stretch marks, and surgical scars can be treated with microneedling. The needles break down the old scar strands tethering down the surface of the skin. Expect 4-6 sessions about a month apart to effectively improve these conditions. With skin care, there is no such thing as a one-time fix. Maintenance is key. Your skin is being damaged by the minute. UV damage and pollution cause further collagen breakdown. To keep up with the aging process you need to incorporate professional treatments such as microneedling or peels at least 3-4 times a year, more often for more dramatic results. Downtime: how much and how bad? Expect 1-3 days of redness decreasing to a pink, some swelling in the first 2 days, then followed by slight peeling for 2-5 days. Expect to see visible improvement at the end of the first week. Microneedling is not something you need to take time off for. The after effects are similar to having asunburn. You can even apply makeup the next day after the procedure. But please choose a healthy makeup that won’t clog your pores. Mineral based makeup is best! Microneedling is a medical procedure, so leave it to the professionals. Microneedling is a controlled micro injury to the skin using a highspeed device to quickly and precisely inject about a dozen tiny needles into the skin, all the way down to the dermis. When your body heals from these microinjuries it stimulates collagen and elastin production, and over the course of 6 weeks you see tighter, smoother, and younger looking skin. This is considered a medical procedure, and should only be performed in medical settings. You’ve seen them all over the internet and your Facebook feed — those handheld rollers, which claim to offer collagen stimulating benefits. DermaRollers may cause more harm than good. The diagram below illustrates this better than I can explain. 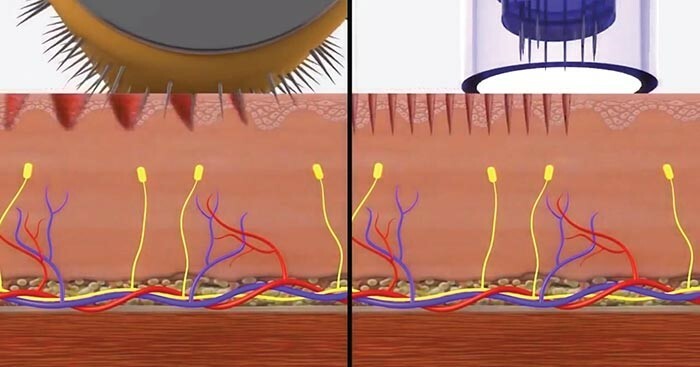 With microneedling, a medical micropen essentially delivers a controlled vertical injury, whereas a dermaroller causes a much wider injury at an angle. The latter can actually cause more harm to the skin and lead to tears in the skin. If you are prone to hyperpigmentation, this can make it much worse. 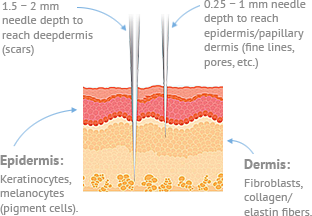 Medical Microneedling devices are able to penetrate deeper into the dermis. This is ideal for treating conditions such as melasma and acne scarring. At-home rollers typically only go to a depth of 0.15mm and medical devices will go to a depth of 2.5mm. That doesn’t sound like much, but in the skin, it’s actually a huge difference as you can see below. Microneedling is worth the hype and buzz, but make sure you have a professional perform the treatment. Some people would argue microneedling is better than some lasers in terms of skin rejuvenation. When done properly, I would agree. Remember, to achieve the best results, you need to have a medical professional perform the treatment. Achieving more dramatic results requires a deeper depth and adequate pre- and post-skin regimen. In this situation, you truly get what you pay for.